A delicious Black and White Truffle Salt Salt made from Italian Truffles! Truffles from the Italian countryside are delicately infused with hand-harvested Mediterranean sea salt to make these aromatic and delicious finishing salts. 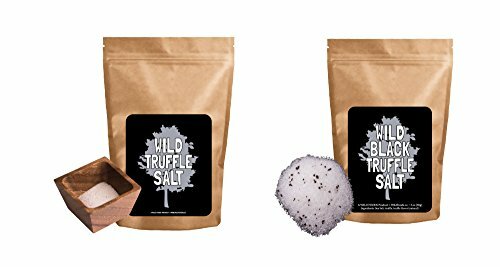 How do I use Wild Truffle Salt? It is perfect as a general cooking salt to add the unique complexity of truffle to any dish. It's best used as a finishing salt. Isn't salt bad for me? You can't survive without eating salt! Salt is an essential nutrient to the human body. Of course, the salt you find in processed foods and at restaurants is the not the kind of salt you want to eat. Control the salt that goes in your body by consuming only premium and natural sea salt and rock salts! Is Wild Truffle Salt gluten-free, nut-free and/or allergen-free? It sure is! Our Truffle Salt is 100% FREE of the 8 major food allergens: Milk, Tree Nuts, Eggs, Wheat, Fish, Peanuts, Shellfish and Soy. It Wild Truffle Salt Guaranteed? All Wild Foods products are backed by the 100% Wild Guarantee if you aren't happy for any reason! Add some complex, delicate and delicious Truffle Salt Bundle to your cart today! Essential Minerals and Nutrition! This delicate Truffle-Infused sea salt is full of 80+ beneficial trace minerals... and it tastes delicious! Fragrant, Earthy with a unique Umami flavor and a twang of sweetness. Will add dimension to any dish! Perfect Texture and Size. The pouch will last for months - Use for Cooking or Finishing your recipes and desserts! Use code WILDSAVE at checkout when you Buy 2, 3, 4, 5, 6, 7 or more products and receive a higher discount for each tier! Mix and match any Wild Foods products. 100% MONEY-BACK GUARANTEE in the unlikely event you are not fully satisfied. If you have any questions about this product by Wild Foods, contact us by completing and submitting the form below. If you are looking for a specif part number, please include it with your message.